It’s her big day! Say I Love You, Mom with this cute, collectible Happy Mother's Day tin filled with 16 classic OREO® cookies that have been hand-dipped in rich Belgian white, dark or milk chocolate. Decorated with sweet Spring-themed floral confections and yellow and white non-pareils, they’re totally scrumptious. Send your own personal message to a mom you love. 16 Oreo® Cookies. 5— Enrobed Belgian Milk Chocolate, Drizzled with Belgian White or Dark Chocolate or Sprinkled with Milk Chocolate Decorettes. It’s her big day! 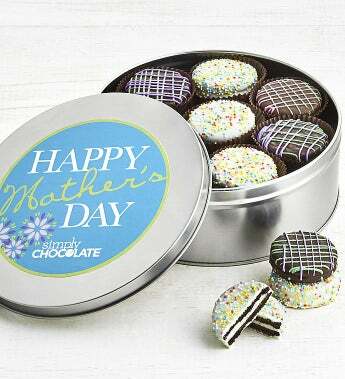 Say I Love You, Mom with this cute, collectible Happy Mother's Day tin filled with 16 classic OREO® cookies that have been hand-dipped in rich Belgian white, dark or milk chocolate. Decorated with sweet Spring-themed floral confections and yellow and white non-pareils, they’re totally scrumptious. Send your own personal message to a mom you love. 16 OREO® Cookies. Please note that the personalized message comes from the card message you enter towards the end of the checkout.